Not all flappers wore short frocks with fringe; classy dames from the '20s also wore longer, more sophisticated dresses like our Sandy Speakeasy Flapper Costume in a dark rich green. 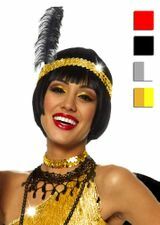 This elegant dress has a longer hemline that makes it perfect for kicking up your heels on the dance floor, and it features a shark tooth hemline that was the bee's knees back in the 1920s. 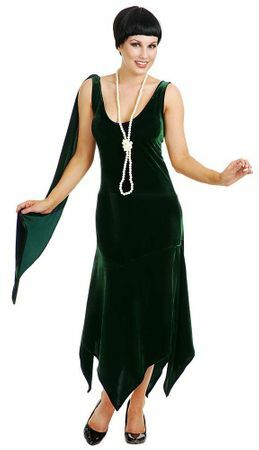 Its stretch velvet material will make you feel like a million bucks, while its shoulder drape adds a little something special. 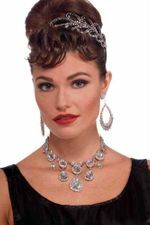 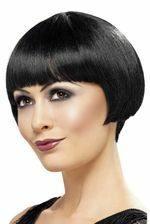 Wear a '20s Wig to complete the flapper look.